Turn in the Path is an unusual enterprise . 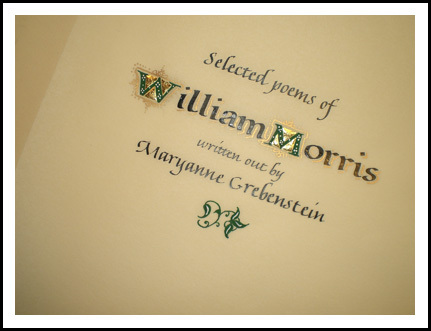 . . we make unique, one-of-a-kind, and limited edition books and broadsides. Our books are hand-lettered, and artfully designed and produced. Some of our books are created because we like the text (click here to see additional images of the Morris Manuscript, shown above). Some of our books are commissioned because someone else likes a particular text. Still others are commissioned for a special occasion - a wedding, an anniversary, a retirement, a memorial, or even a marriage proposal! Not only is our business unusual, but so is our name. It derives from a technique that was used in the Book of Kells, and perhaps other manuscripts of that era. It refers to a design that shows a stylized peacock - similar to our logo - directing the reader to the next line of text. It is necessary, and somewhat secretively puzzle-like, because the text continues on the line above rather than below. This reversal of direction - or turn in the path - also applies to how our book business came about.